Tamarack trees in the swamps of Oakland County are tinged in smoky gold. Straggler monarchs are winging south as days shorten and winds roughen. Crisp evening air is rich with the rhythmic song of crickets. Ruby-throated hummingbirds are in near frenzied activity at feeders. Geese are beginning to gather on palatial lakeside lawns and golf course greens in preparation for migration as flocks of robins and more than a few eastern bluebirds strip berries from dogwood thickets. All these signs of nature’s seasonal change signal the dawn of the autumnal equinox. But it is the accelerated nut-gathering activity of boisterous red squirrels (Tamiasciurus hudsonicus) that finalize the fact that the season of warmth is drawing to a close. Oakland County is home to the gray squirrel (often jet black in color), the fox squirrel, the northern flying squirrel and the red squirrel. 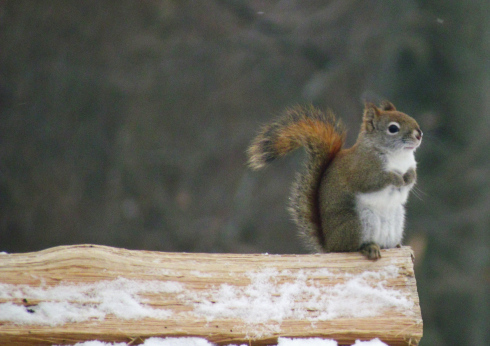 The red squirrel is a species that visits bird feeders in winter but is most at home where an abundance of pine and spruce cones or black walnuts are present. Hikers who seek early morning solitude in our larger parks (Addison Oaks, Independence Oaks, Orion Oaks or Rose Oaks County Parks) are likely to hear the chatter of this noisy little squirrel. Red squirrels are found throughout Oakland County but they are most common in or near coniferous (evergreen) woods. The red squirrel is rusty red with a whitish belly and about half the size of a gray squirrel. In these early days of autumn they seem to have a perky disposition and use their chattering, rattling call when disturbed. Food storage for winter is the chief activity of the red squirrel from now until snow blankets the woods and fields. 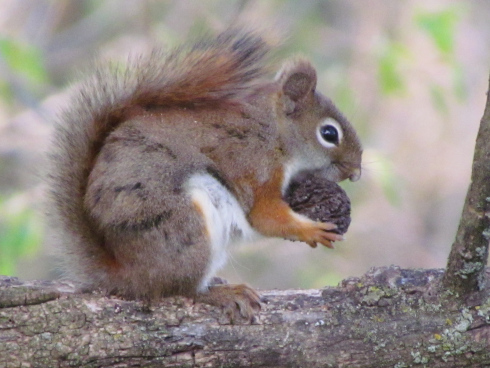 Almost all the waking hours of red squirrels on the wilder side of Oakland County are spent scurrying to their favorite trees to bring home a bounty of cones or nuts. These are then stored in hollow trees, or on occasion, in the attics of human homes. 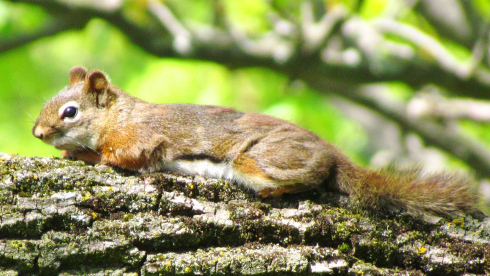 But no matter how much work there is to be done, when the sun shines after a hard day’s work there is nothing better than to sprawl out on a tree limb and just snooze. And that is something we can all understand. Visit Oakland County Parks for information on all 13 Oakland County Parks including special events, nature education programs, camping, volunteer opportunities and rules and regulations.